Consult with clients, vendors, personnel, and construction foremen to discuss and formulate estimates and resolve issues. Analyze documentation to prepare time, cost, materials, and labor estimates. Prepare estimates used by management such as planning, organizing, and scheduling work and selecting vendors and subcontractors. Review documents, such as production schedules, work orders, or staffing tables, to determine personnel and materials requirements or priorities. Revise production schedules when required due to changes, labor or material shortages, backlogs, or any interruptions, collaborating with management, marketing, sales, production, or engineering. Plan production commitments or timetables for business units, specific programs, or jobs. Maintain all accounts receivable and payable. Ordered and Organized all office supplies for the company. Print & distribute financial reports Issues and maintains Certificates of Insurance for the company. Bank reconciliation in Quickbooks Greet and assist clients. Direct calls and respond to inquiries. A/R track truck log Create and send invoices daily Receipted and posted cash, check and credit cards from customers due on Accounts Prioritized and managed new accounts and registered equipment Contribute ideas for improving customer satisfaction. Maintain listing of all accounts receivable and payable. Assisted H/R/Payroll Managed & Maintained all vendor accounts while updating files and numbers all warranty info billing work order entry assist dispatch maintain all dot logs. 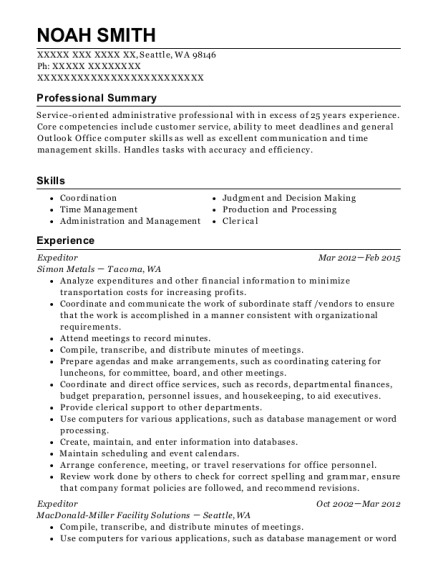 Manage and oversee both restaurant locations employees. Assist with any daily operations Customer conflict resolution Ordering all food/supply Making weekly schedule Handle employee disputes Enter timesheets Write ups Conduct meeting before every shift Count down drawer after every shift Open/Close store. Daily Marketing strategies and meeting with potential customers and/or vendors Accounts Receivable/Payable Receipted and posted cash, check and credit cards from customers due on Accounts Order merchandise and negotiate special pricing Assisted customer with questions accounts and merchandise Greet & oversee prospective client applications,qualify,determine needs, and verifications Maintain awareness of local market conditions & trends Contribute ideas for marketing company & for improving client satisfaction. 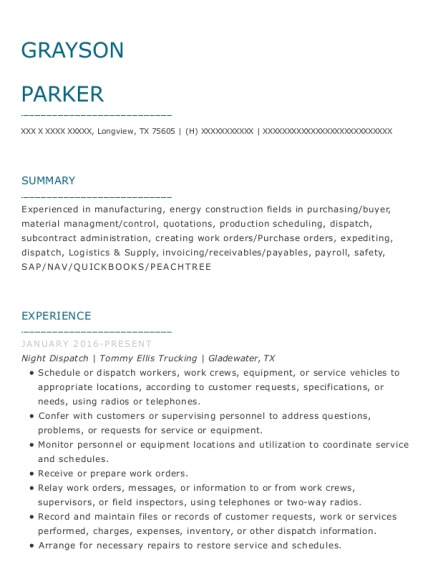 This is a resume for a Night Dispatch in Longview, Texas with experience working for such companies as Tommy Ellis Trucking and Konecranes 6 mo Contract. 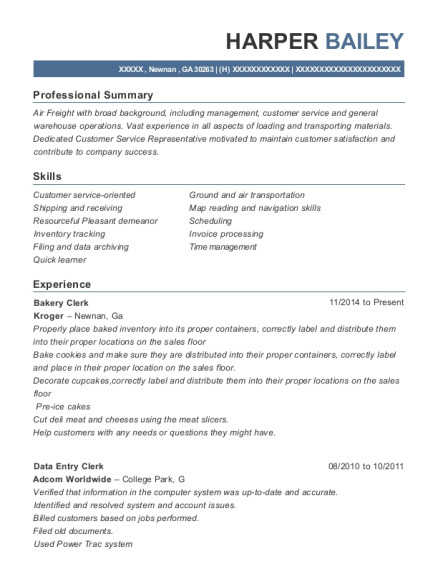 The grade for this resume is 0 and is one of hundreds of Night Dispatch resumes available on our site for free. 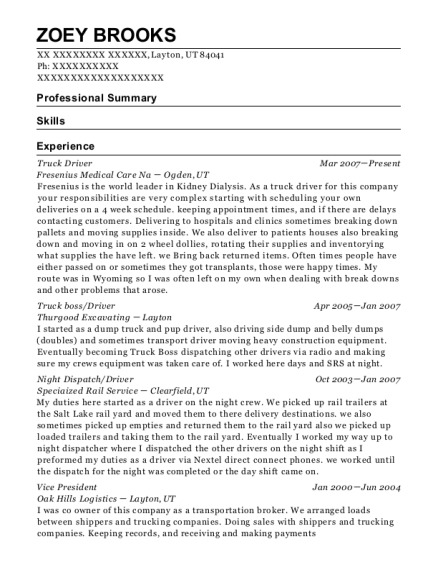 Use these resumes as templates to get help creating the best Night Dispatch resume.